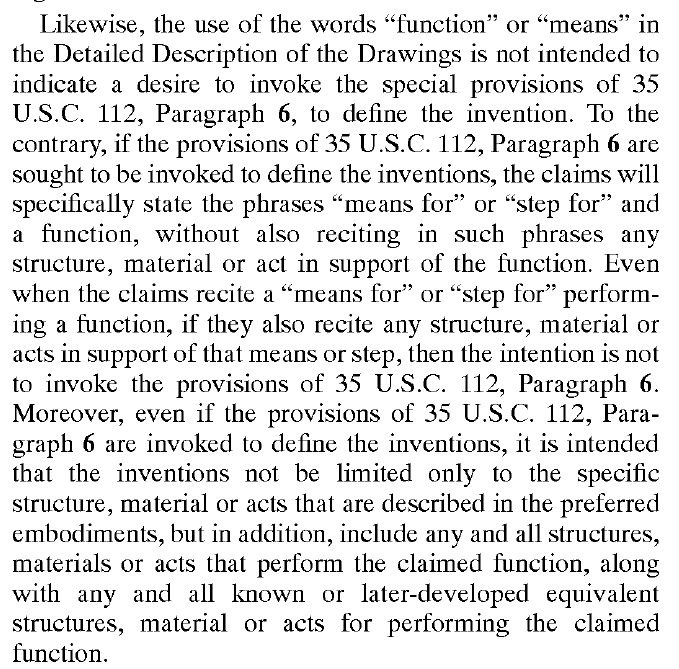 The patentee has attempted to recapture the widely misunderstood meaning of “means” prior to In re Donaldson, by covering all possible means for performing the stated function. Maybe redefining “means” is a step too far, but if the test really is how the words are understood by persons of ordinary skill, would an express statement that “none of the claim terms are intended to be construed under 35 USC §112(f)” affect how a person or ordinary skill in the art would understand the claims? Whether by defining means to include “any means” as in U.S. Patent No. 6167810, or defining a functionally named element to include “any means” as in U.S. Patent No. 6909672, an applicant can try to exert some control over how the functional elements in its claims will be construed, as long as the applicant is mindful of the written description and enablement requirements of the other parts of §112.